[Kerber] got his hands on a classic 1950’s General Electric fridge, and converted it into this classy vintage kegerator. As his build log shows, it took an intensive restoration process to get this fridge back in shape. He completely stripped it down, scraping off the sixty year old insulation, fibreglass, and glue. Then the chassis was sanded down to a smooth finish and painted black. R-19 insulation was added to replace the old stuff. Next up was electronics. An Arduino, DS18B20 temperature sensor, and a solid state relay were used to regulate the temperature and prevent frozen beer. There’s also a Guruplug server that reads data from the Arduino every minute. It makes this data accessible through a web page, so the temperature of the kegs can be monitored from anywhere. [Kerber] admits that this is overkill, but leaves room for future expansion. The kegerator draws about 180 Watts, and runs for about 6 minutes per hour to keep the temperature regulated. This is pretty impressive considering the age of the fridge. The final restoration looks great, and serves up data along with the beer. [Doragasu] had been using a hacked Xbox as his file server but upgraded to a single board Linux device when the GuruPlug was released. Unfortunately the first run of these devices had an overheating issue, which resulted in reboots even at moderate CPU load. The design was changed from a passively cooled heat sink to an internal fan, but that didn’t really help those who already had one of the early models. Above is [Doragasu’s] method of cooling down the overheating computer. The original sink — which was really just a fin-less metal plate — was removed and replaced with a proper heat sink. This makes contact with the ARM, RAM, and Ethernet chips. They were all coated with thermal compound before installation and a silent fan was added to help whisk away the heat. This still fits inside of the original case, but to make way he did remove the original power source and cut a hole to allow for air movement. The post also details an external LCD screen used to display system information. It’s along the same lines as this USB LCD screen project which inspired him to send us a link to the project. Meet GuruPlug, an all-in-one server that is now available for pre-order. This is the next generation of the popular SheevaPlug that features some added goodies. 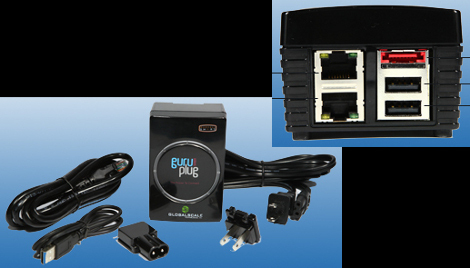 The base model sells for the same $99 and appears to have the same specs as the original but for $30 more, the GuruPlug Server PLUS moves to 2 Gigabit Ethernet ports, one eSATA connector, and built-in WiFi and Bluetooth. All of this for $129 and it only pulls 5 watts? Wow. Update: Thanks to [Foerdi] and to [Phil Burgess] for the pointing out that the hardware diagram on the features page shows WiFi and Bluetooth for both models.